Its PERFECT. At Rs. 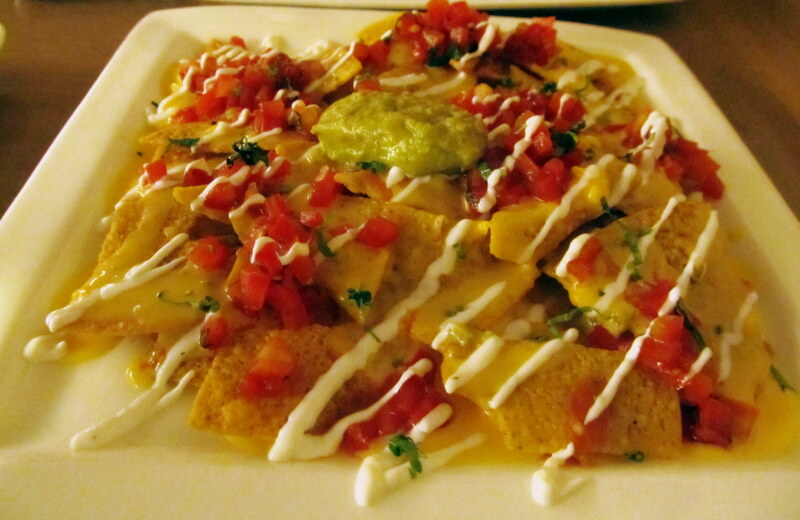 100, I am very happy and dive into the nachos. The Nachos were full of flavour. Crunchy and tasty. However, the cheese sauce was less but we were giving an additional helping as soon as we asked for it. The portion size is very small. At Rs. 425, its just a layer or two of nachos scattered across the plate. At such a price I would have expected to find a nice small heap of nachos which could almost serve as a mini meal by itself! 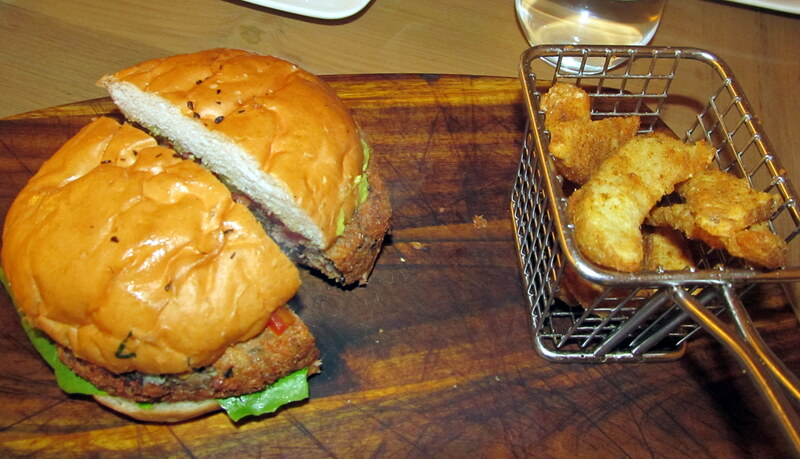 For mains ordered the Habanero Spiced Black Bean burger and an Indian Salmon. Its a good burger, but the potato wedges steal the show – easily. The burger is a black mean mince with avocado tapenade and tomato salsa. The burger is average. Priced at Rs. 425, I find it on the expensive side. (These prices are exclusive of Service tax and Service Charge) For vegetarians, the choice in burgers is this or a mushroom based one. However, met with the chef and they are introducing more options in veg and non-veg in the coming few weeks. Eat this with their mustard sauce and I go Ummmm…….. The mustard sauce is just like the one served at Indigo Deli. The Indian Salmon is a pan-seared rawas served on a bed of mashed potatoes, served with zucchini and green onion cream sauce. At Rs. 525, its a great dish to be had as a main course. 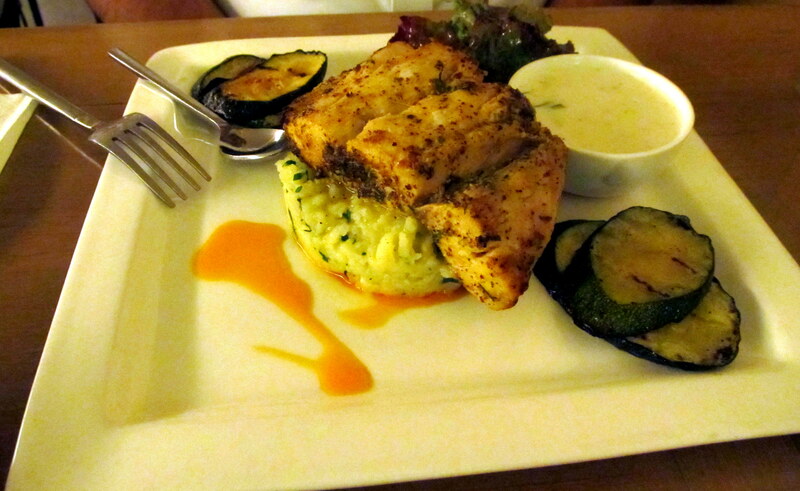 The fish is cooked flawless, the mashed potatoes are well herb-ed , the zucchini and eggplant are well-sauteed and all of this is brought together with the lightly flavoured green onion cream sauce – the sauce is just awesome – no other words to describe it. The dish on the whole gets a 4 on 5. The dinner was a good end to the day. 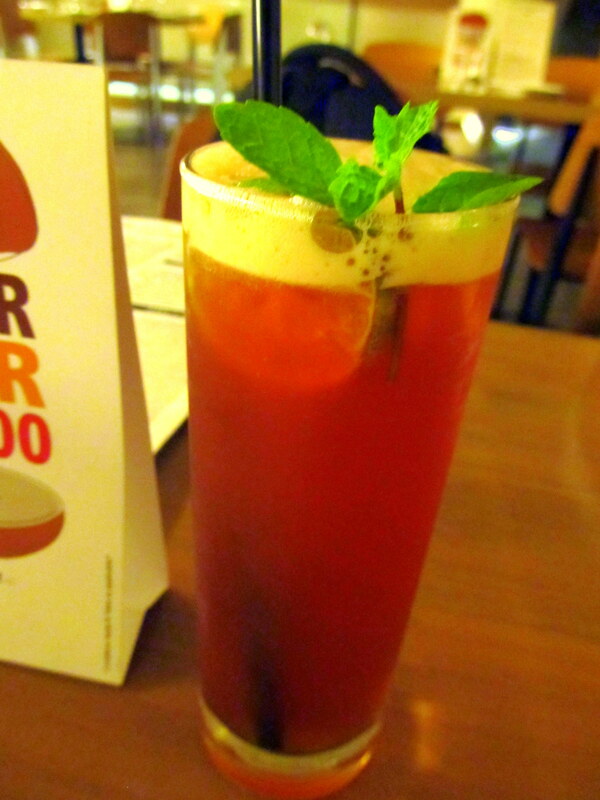 I am definitely going back to try the other options on the menu, especially their beverages and desserts – next time. Chef is a young man, friendly and helpful. The staff attentive and discreet. 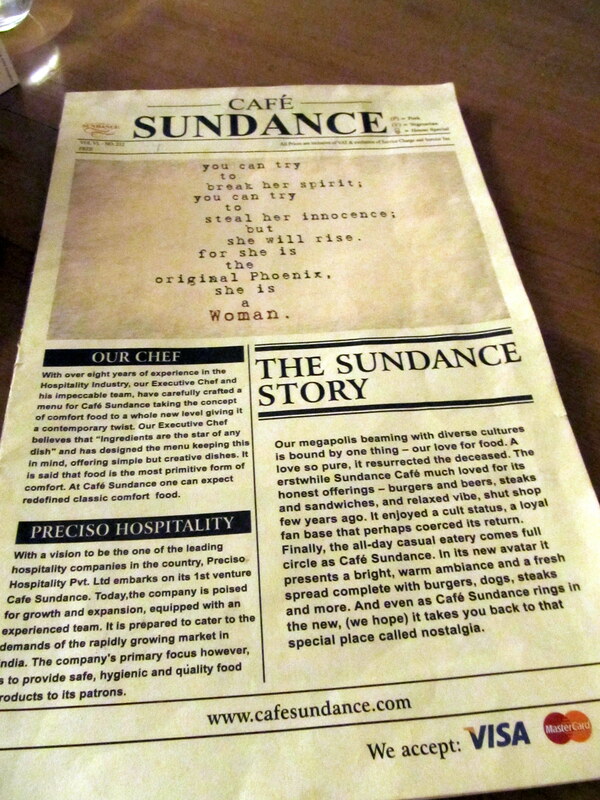 Go to Sundance Cafe and enjoy a good meal. I know many people who just love Theobroma – I’m not one of them. I’m very selective of what I like there. Their Chocoholic cake / pastry is fantastic. I always go for that as in the past I have not really enjoyed their other desserts or savories. 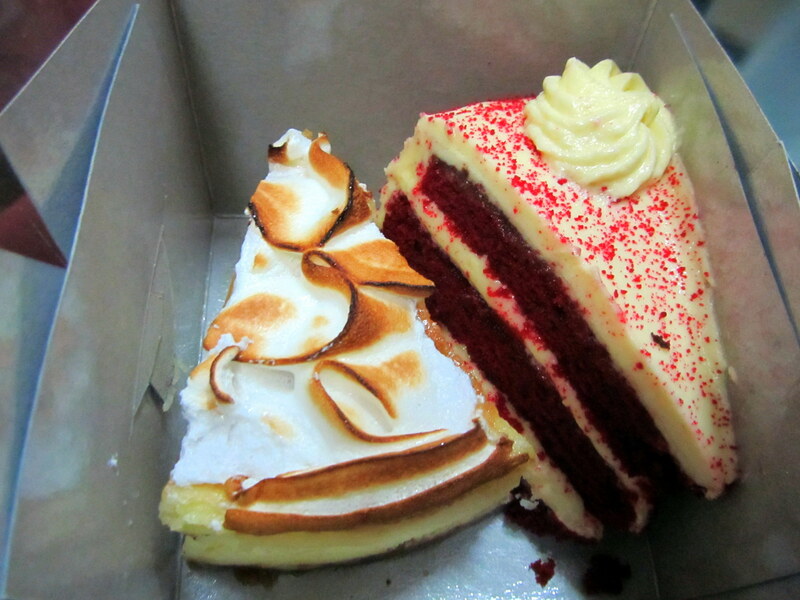 However, over the weekend I was surprised by hubby bringing me 2 pastries from there – they are the new additions to desserts counter – the Red Velvet cake and the Baked cheese dessert. 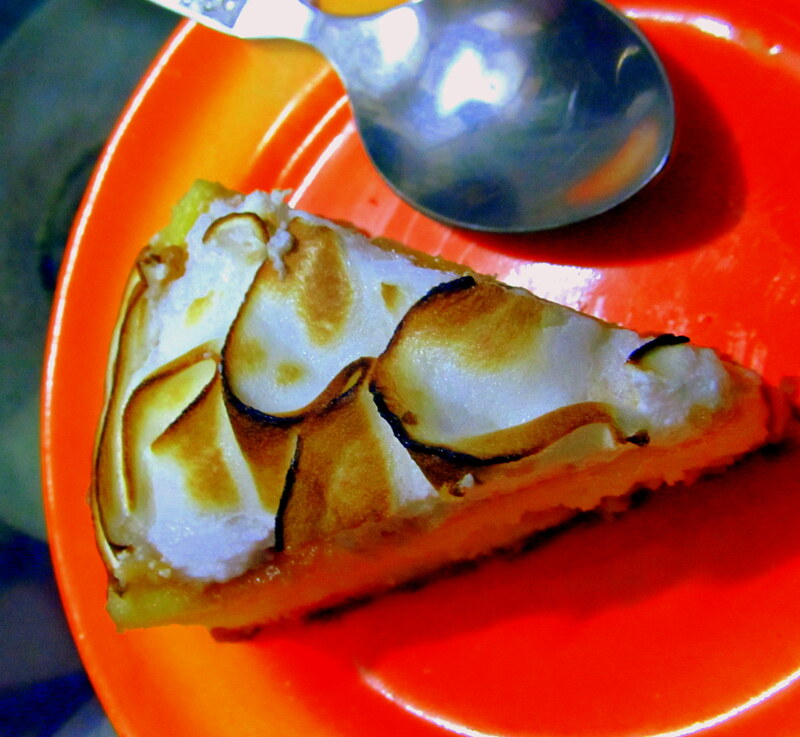 Tried the Baked cheese dessert – ummmm…..heaven..just melt in the mouth. Loved it. Price – Rs 120. Its a heavy pastry but I had to eat the other one too – so here goes…. 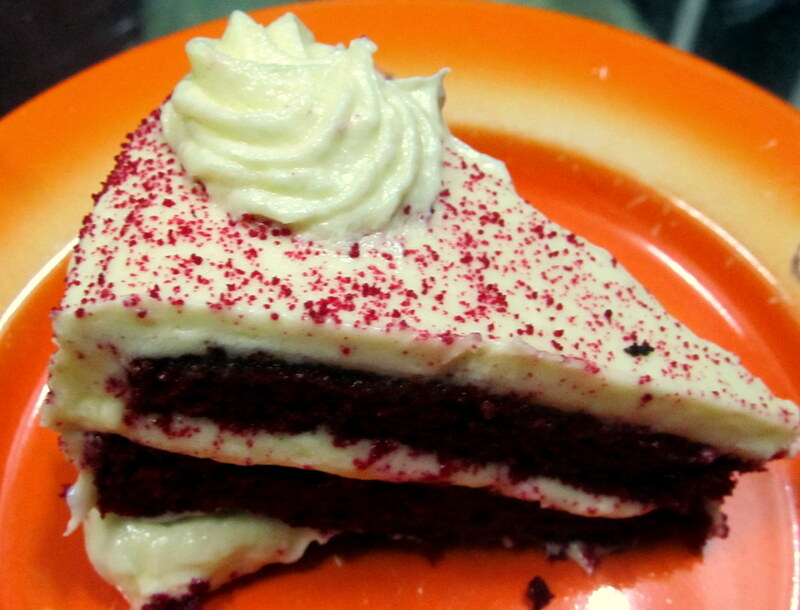 Another piece of heaven in my mouth……it’s got a hint of raspberry and the custard-y icing is gooey and slurp-y. Price – Rs. 90. I must say that my opinion of Theobrama has changed on eating these two pastries. I shall now definitely be open to going there more often. THEY ARE BACK ON THE STREET !!!! YIPEEEEE……. After serving for 35 years and more, 10 years ago, they were made to stop selling their food on the street. ‘B’ Road at Churchgate, just opposite Intercontinental hotel (then Natraj hotel), at the pavement turning, the pani-puri wala used to set his shop every evening. 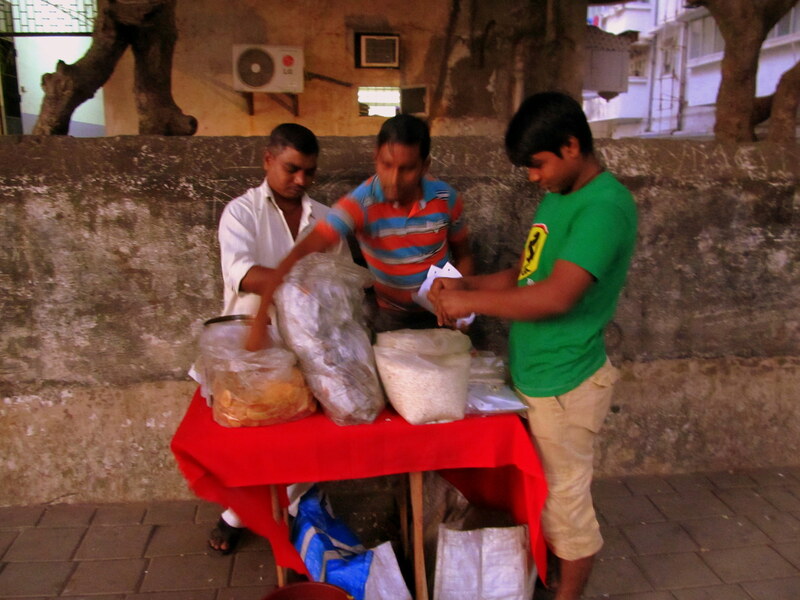 A building away, the bhelwala would make the yummiest of fares. They were very well know across town. My aunts from 25 kms away, when visiting us would insist on being served only their foods. 2 months ago, the pani-puri wala returned to his usual place. He sets shop at 4:00 p.m and ends his day at about 9:00 p.m. – that’s approximately the time by when his foods start getting over! All the dishes are amazing. If you want to try all his dishes, then go for an early dinner there. Start with a pani-puri. 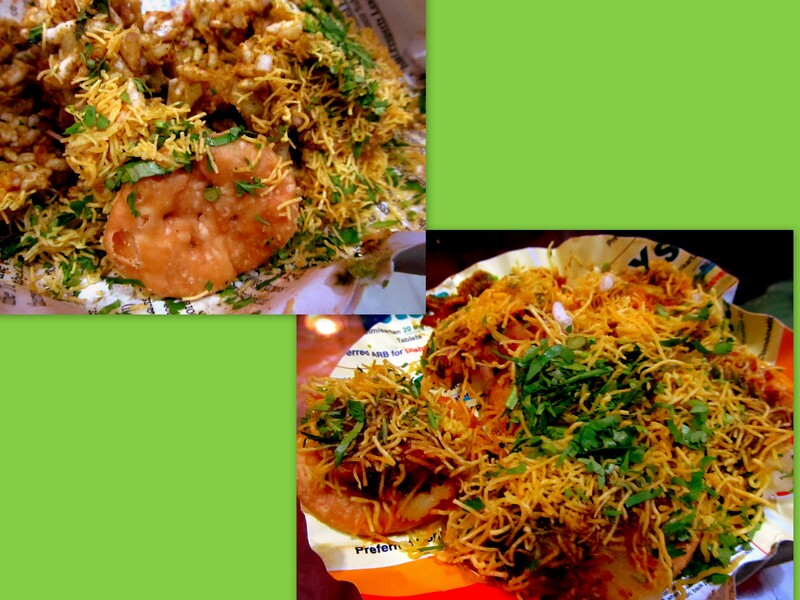 Eat a ragda-pattice or a dahi-batata puri and end with a churmur (a bhel made with his food paraphernalia). All dishes priced at Rs. 30 each. The bhelwala, for the last 10 years would go building to building, selling his stuff. All one had to do was give him a call and he would come home with his trappings and make whatever you want freshly at the door. Now he is back at the street too. 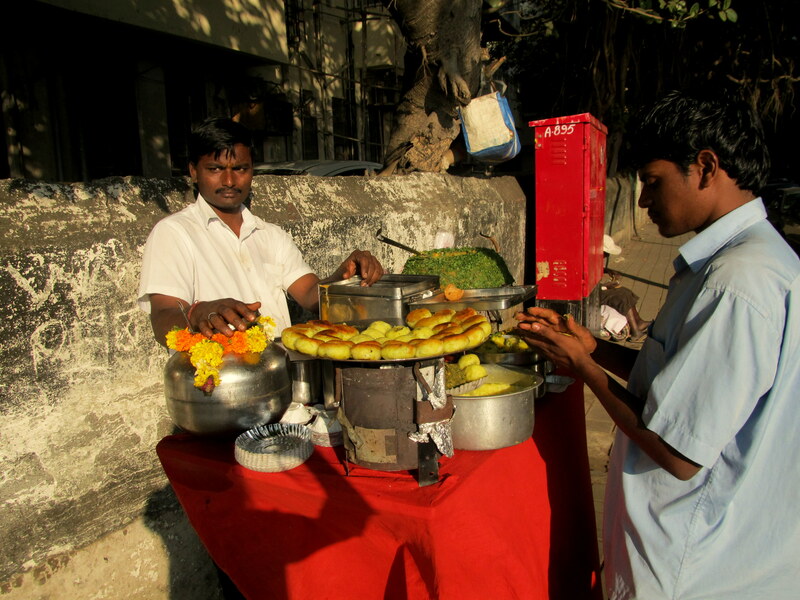 10 paces from the pani-puri wala, the bhelwala set his stand a month ago. He starts serving from 6:00 p.m. onwards everyday. Ask for a bhel, sookha or otherwise or a sev puri and relish. Priced at Rs. 20 a plate, each bite is a pleasure. 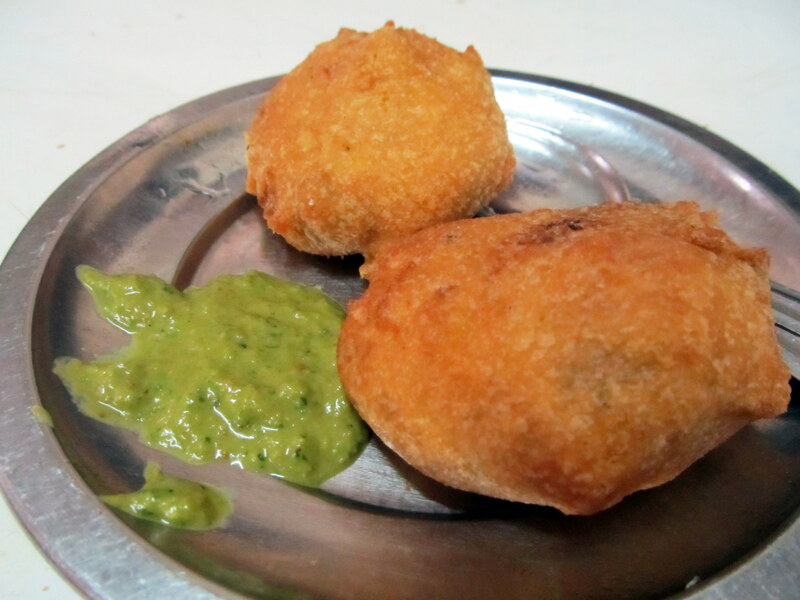 Loving chatpata stuff, I grew up on these 2 street foodwalas. The sons have taken over from their fathers. ENJOY folks as they are back! This was my dinner tonight. 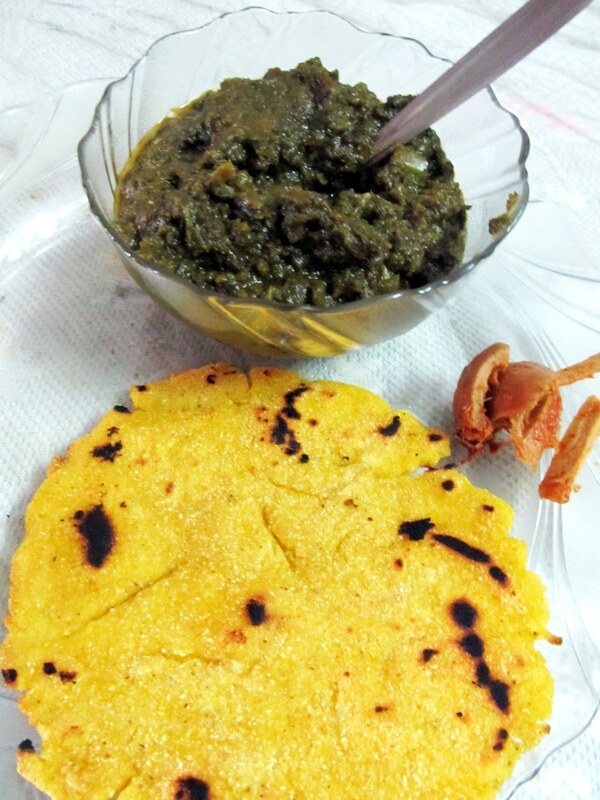 I love Chole-Bathura. However, trying not to eat too much of fried food, instead of making bathura at home, I just ordered -in a butter naan. 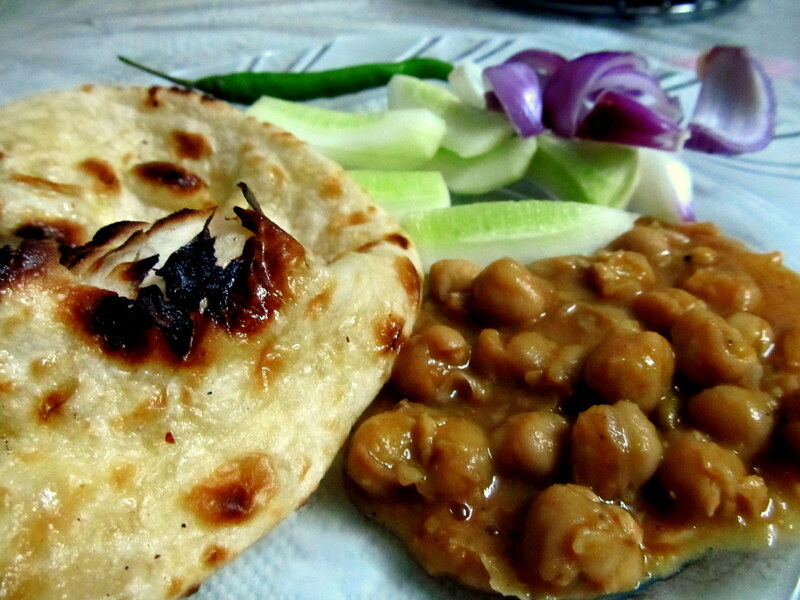 Give a Punjabi Chole with bathura, kulcha or then a naan; serve it with onions and raw green chilies and he will be very satisfied. I am! End to a good weekend. This small-ish eatery has been in the heart of Colaba market for years. 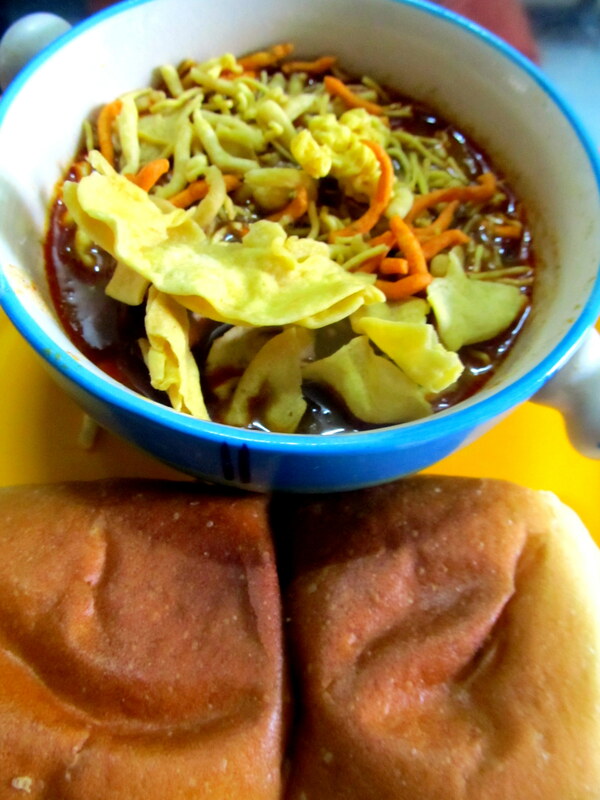 But it is only recently that my yearning for misal pav, got it my attention. Actually, rather my husband’s attention. 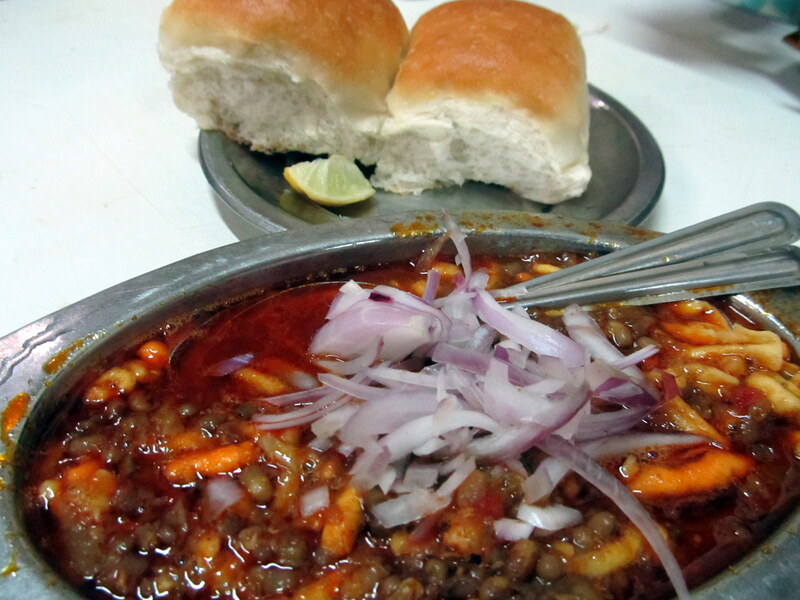 Recently, I was so wanting to have misal pav and did not know any place close-by (around Colaba market) to eat from. My sweet hubby, came down to the market and approached this eatery. THEY SERVED MISAL PAV! And its good. 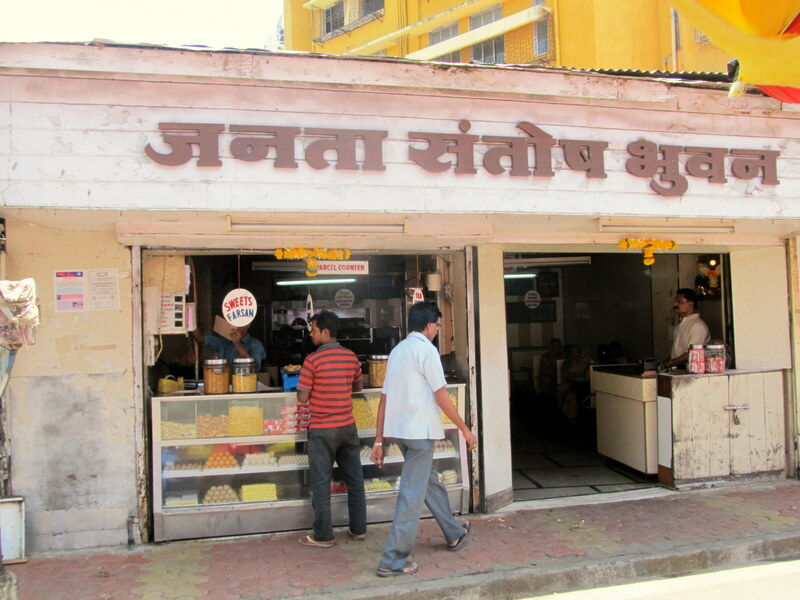 I’ve now eaten here misal pav numerous times, and packed it for home as well on umpteen occasions. 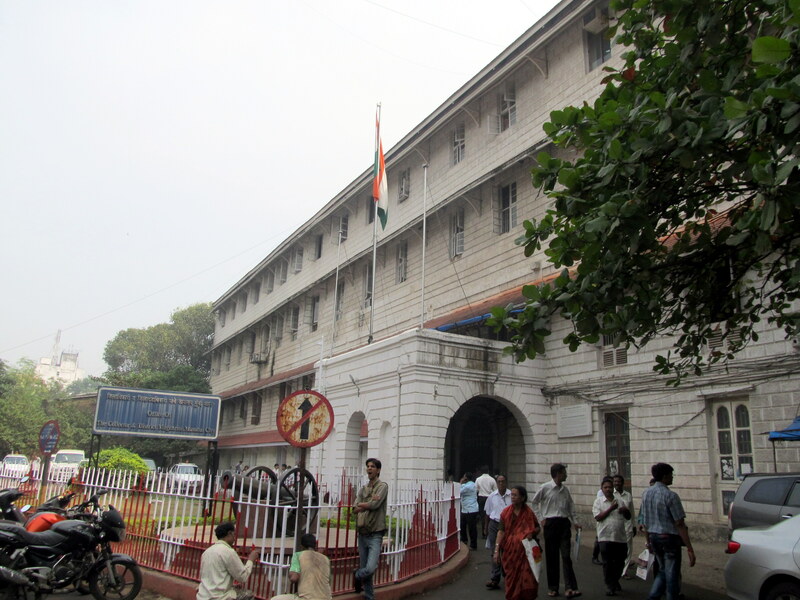 Janta Santosh Bhuvan is located right in the center of Colaba market. It is at the corner of one of the lanes leading into the market center. Its also known for its farsans. I have picked a few of them on occasions and they are very tasty. 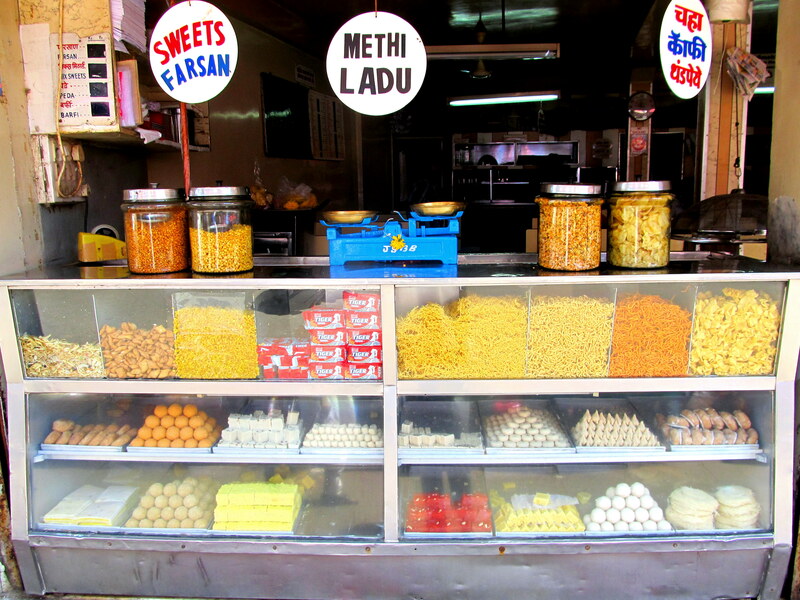 Mithais (sweetmeats) too are good. I would recommend this eatery be checked out by all who want a good snack. Another plus for it – its their tea. Its hot and refreshing at Rs. 10. I love the tea there. Sometimes I just go to the market on a pretext of running an errand, to have their tea. 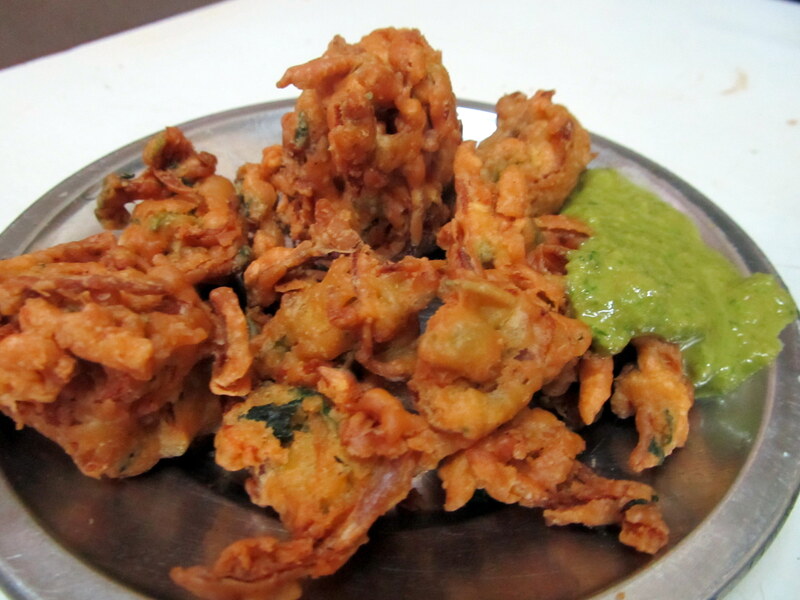 Only snack of theirs I have tasted and not liked are the bhajias. Many of make boondi – raita at home. I endorse the boondi from this shop. Extremely crisp and fresh. 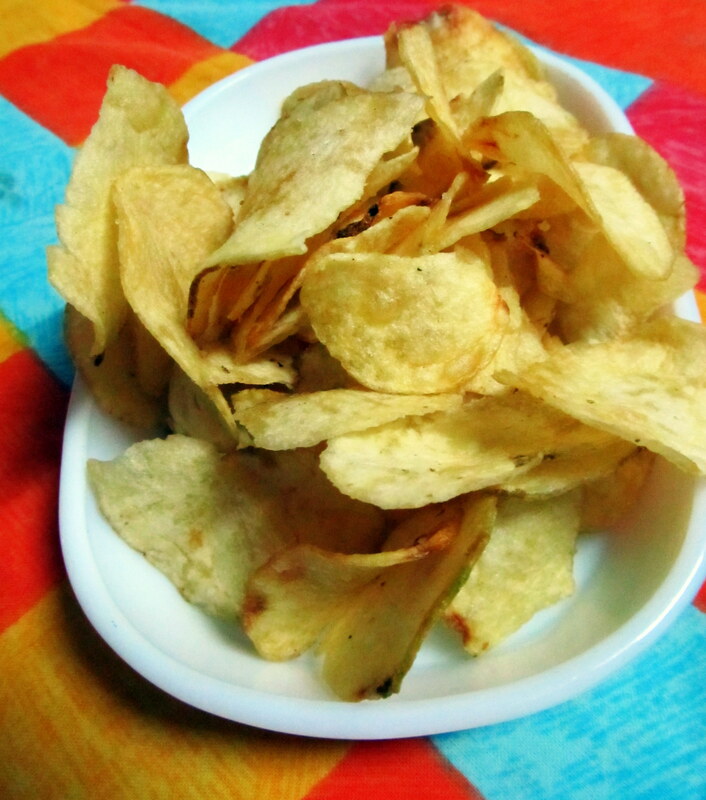 Another must have – potato wafers. By far, they pack one of the best wafers in town. I have served it to many guests and all have asked me from where the wafers are, as they are excellent. Till a month back they retailed the wafers at Rs. 200 at kg, today it sells at Rs. 300 a kg. I appreciate this shop for the snacks. Its owner is a wonderful gentleman who mans the cash counter.